One of the best things about the internet is the proliferation of information about almost every topic under the sun. While it is great to be able to hop onto your smart phone and look up almost anything, there are some fields that the internet isn’t necessarily suited for. When it comes to legal and financial advice, it is a good idea to avoid most sources that you find online because they don’t come from an actual attorney. Many people have followed advice they found online and ended up paying for it later. Read on to learn about two common mistakes that people make when they are trying to protect their assets and then check back soon for part two in which we will talk about two more mistakes that you need to avoid. 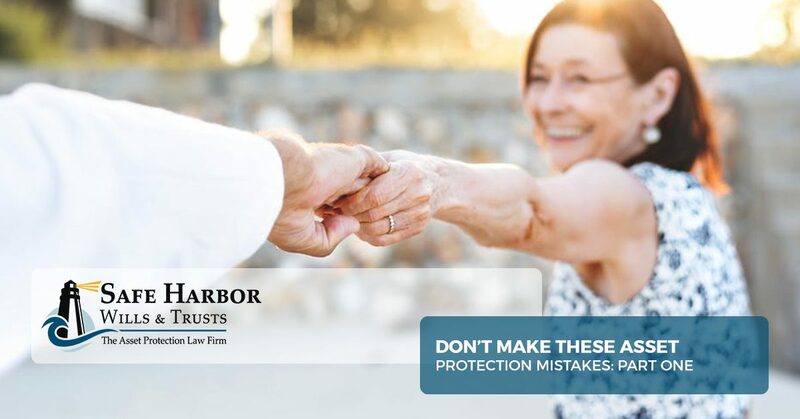 If you have taken some of this bad advice, or you don’t know where to start with asset protection, contact Safe Harbor Wills & Trusts in Syracuse and Watertown. Our firm is dedicated to helping people find the best ways to keep what they have worked for safe and to plan ahead. Our advice is based on years of experience and legal knowledge that is tailored to your specific circumstances. At our firm, we don’t believe in the “one-size-fits-all” mentality because no two people have the same circumstances or needs. Call us today for a consultation about asset protection, creating a will or a trust, or if you are trying to find the best way to handle an elder law emergency. When you have spent your life working and earning money, there are many ways that you may have saved or invested. Other events may have caused you to lost money or have ongoing financial obligations. It is because of all of these potential variables that it is nearly impossible for a premade plan that is offered by some attorneys or investment companies to be a good fit for you. Even plans that are “customizable” usually fall very short of protecting your assets in as thorough a way as possible. The only way to have complete asset protection is to trust an attorney to design and implement a plan that is 100 percent yours. At Safe Harbor Wills & Trusts, that is exactly what we offer. There is no “starter” plan because even the person with the most straightforward needs still deserves to have their assets managed and protected by someone who knows the ins and outs of their situation. The rise of the internet “expert” has created a lot of problems for a lot of people. Whether these unsuspecting people were fleeced by someone who set out to separate folks from their money, or whether their intentions were good and they couldn’t have foreseen what would happen to certain individuals, the fact remains that a lot of the “free advice” offered by people online is no more than simple nonsense. What may have worked for them or for a few other people is not likely to work for many others for a multitude of different reasons. While a nice website and a smiling face might make someone seem competent or trustworthy, there is no viable alternative to seeking out help from a qualified and experienced attorney who works exclusively in the field. Think about it this way: you wouldn’t trust someone who said they could perform open-heart surgery on you if they hadn’t done it before and hadn’t attended medical school, would you? While that analogy might seem extreme, trusting someone who thinks they are a doctor with your life is not that much different than trusting someone who says they are a financial expert with the assets you have worked your entire life for. Contact our offices in Syracuse or Watertown today to learn more about the ways that we can help protect you from asset protection mistakes that could cost you everything you have worked for. For more than a decade, our firm has done everything possible to offer the best advice and strategies for protecting your assets from spurious lawsuits and predatory collectors. When you need help, we want you to think of the calm waters that Safe Harbor Wills & Trusts can offer you.